RICCARDO PIACENTINI was born in Moncalieri (Turin, Italy) on 3rd July 1958. At the age of twenty-two he obtained his diplomas in Composition and Piano and then, at the Turin University, he graduated with top marks in History of Music with a thesis on Goffredo Petrassi. Other diploma in Choral Music and Choir Direction. Pupil of Carlo Pinelli (Ghedini’s pupil) and Roberto Cognazzo at the Turin Conservatory (1974/80), as well as of Giorgio Pestelli, Paolo Gallarati and Enzo Restagno, he followed perfection courses and seminars with Franco Donatoni (1984/87, Accademia Chigiana in Siena and Perosi International Academy in Biella), Sylvano Bussotti, György Ligeti, Ennio Morricone, André Richard (as grantee De Sono), Karlheinz Stockhausen. In 1988 he took part with performances of his works in the “Internationalen Ferienkurse für neue Musik” in Darmstadt. Piacentini has been a prize-winner at international competitions and selections, including Presteigne International Festival in Wales, where he represented Italy in 1992 with Ti i for violin and harp, ICONS in Turin (first international price with For four for string quartet), Nuove Sincronie in Milan (Amariamori for G flute), Mario Zafred and Franco Evangelisti in Rome (Keir for orchestra and again For four), and “Accademia Musicale Chigiana” in Siena with the cooperation of Radio France and “Conservatoire Superieur de Musique de Paris” (... et coetera for ten players). 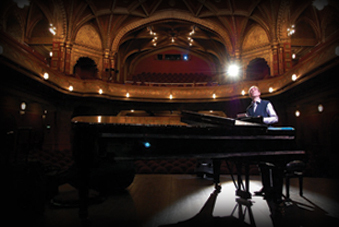 His music is regularly performed in prestigious concert halls and festivals with alluring reviews. 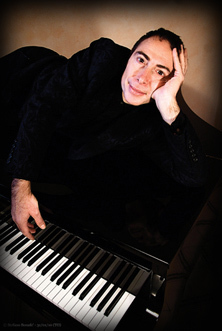 In February 1997 he was invited, with Giacomo Manzoni, to appear as a guest composer at the Festival of Italian Contemporary Music in Vancouver, where his Spiritual Drama in one act and three scenes Mal'akhim gave its first performance and where he took seminars on his own music at the Simon Fraser University, the University of British Columbia and the Vancouver Academy of Music. Many concerts and seminars on his music in Institutions such as: Albuquerque – University of New Mexico (Composers' Symposium 2008), Almaty – Conservatory, Arequipa – Universidad Catolica San Paolo, Baltimore – University of Maryland in Baltimore County (UMBC), Basel – Academy, Belgrade – ArtLink Festival and Stankovic Conservatorium, Beijing – Central Conservatory e Beijing Modern Music Festival, Berkeley – University of California, Berlin – Musik-Biennale and Unerhörte Musik at BKA Theater, Bowling Green State Universtity, Brno – Janacek Academy, Budapest – Budapest Spring Festival at Urania National Theater, Buenos Aires – Colon Theater and Centro Cultural San Martin, Canton – XingHai Concert Hall, Darmstadt – Orangerie, Graz – University, Haverford College, Helsinki – Sibelius Academy, Hong Kong – Academy for Performing Arts, Houston – Four Oaks Auditorium, Jakarta – Arts Academy and Pelita Harapan University, Kiev – National Taras Shevchenko University, Köln – Neue Musik Köln - Festival all'Italiana, Kragujevac – Knjazevsko-Srpski Teatar, Krakow – Main Concert Hall and Florianka Saal in Music Academy, Lima – Pirandello Theater, London – Festival Roussel, Madrid – Centro Cultural Buena Vista and Palacio Abrantes, Malta – La Valletta Hall, Marseille – Theatre National, Melbourne – Xavier College, Chapel off Chapel and Federation Hall, Milan I Pomeriggi Musicali at the Teatro Dal Verme, Moscow Conservatory, Münich – Gasteig, New England University (Australia), New York – Mannes College and Modern Works, Paris – Conservatoire National Superieur and Radio-France, Portland State University (Oregon), Riga – Latvia University Theater, Rio de Janeiro – Escola de Musica - Conservatorium, Roma – Santa Cecilia Academy, Festival Nuovi Spazi Musicali, Musica d'oggi and Nuova Consonanza, Rutgers State University of New Jersey, Seoul – Joong Ang University, San Paolo – Circolo Italiano, Shenyang – Liaoning Grang Theater and Conservatory, Singapore – Jubilee Hall and Nanyang Academy of Fine Arts, St. Mary's College of Maryland, Stanford University, Sidney – Conservatory, Tashkent – 3rd and 4th International Festival of New Music, Torino – Settembre Musica and Festival MI.TO, Toronto – SoundaXis Festival at Music Gallery and Bata Shoe Museum, Ulaan Baatar – Opera-Ballet Theater, Vilnius – University Theater, Washington – Levine School of Music, Waterloo – Wilfried Laurier University, Wien – Klangforum and Creatives Centrum, etc. In December '99 “Mal'akhim” was represented again in Turin, in the Metropolitan Cathedral with the staging by Teatro Regio and the whole national RAI broadcast. In October 2000 the same opera gave another performance for the International Celebration for the Holy Shroud. In February ‘99 his show for children 7x7+7 was represented at the Santa Cecilia National Academy in Rome and, two months later, at the Ilkhom Theater in Uzbekistan. Always in ‘99 Piacentini composed Musiche dell'aurora (Dawn musics), recorded on two CDs like enviromental music for the 8th Biennial International of Photography in Turin, first official example of “foto-musica con foto-suoni“© (“foto-musica con foto-suoni”), followed by Arie condizionate (Air conditioning) with original texts by Sandro Cappelletto on a cd for the 9th Biennial International of Photography (2001) and, again on Cappelletto's texts, by “Sine nomine” for the commemoration of Shoa' at Carlo Felice Theater in Genua (2002), Treni persi (Lost trains, 2003) for the Train Museum in Bussoleno, Mina miniera mia (Mine my mine, 2004) for Traversella mines and Musiche della Reggia di Venaria Reale (Music for the Castle in Venaria Reale, 2005). His works have been published by Curci, Edipan, Agenda and Rugginenti. Recently the Curci Editions pressed his text Armonia tonale [Tonal Harmony] too, for the studies of Composition in Conservatory, and, in 2011, I suoni delle cose [The sounds of things] - Poetica del foto-suono tra Filosofia, E(ste)tica e Musica presented at MiTo Festival in Turin, DMS in Bologna and Teatro La Fenice in Venice. His scores have been published by Curci, Edipan, Agenda and Rugginenti. Recently the Curci Editions pressed his text “Tonal Harmony” too, for the studies of Composition in Conservatory. He has made CDs and recordings for Radio-France, RAI, RSI, Radio Nazionale Uzbeca, Radio Vaticana e per le etichette Curci, Datum-Stradivarius, DDT, Edipan, Happy New Ears, Nuova Era, Rainbow, Rivoalto, Steirischer Tonküstler Bund, Stradivarius. 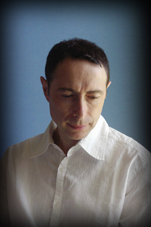 As pianist he works regularly in partnership with Tiziana Scandaletti, soprano, with whom in ‘97 he founded the Duo Alterno (tours in Argentina, Australia, Austria, Belgium, Brazil, Canada, China, Denmark, Finland, France, Germany, Holland, Hong Kong, India, Indonesia, Kazakistan, Latvia, Lithuania, Macedonia, Malta, Mongolia, Norway, Peru, Poland, Russia, Serbia, Singapore, Spain, Sweden, United Kingdom, USA, Uzbekistan...) and made first recording of Giacomo Manzoni's “Du Dunkelheit” and of the whole sacred works for voice and piano by Giorgio Federico Ghedini. Other monographic CDs on lyrics by Ghedini (Canti e strambotti), Alfredo Casella and Franco Alfano). For Stradivarius label La voce contemporanea in Italia - 1st CD, 2nd CD, 3rd CD, 4th CD, 5rd CD and La voce crepuscolare - Notturni e serenate del '900. He is also the founder and director of the Rive-Gauche Concerti in Turin and teaches Harmony, Counterpoint, Fugue and Composition at the Alessandria Conservatory where he is the chair of the Composition Department. Do you know what is "foto-musica con foto-suoni" ©? Since 1999 to today Riccardo Piacentini realized many works and several writings, published on specialistic reviews, about "foto-musica con foto-suoni" ©, which is a technical expression patented from the same composer to define a particular kind of ambient music. In this one Piacentini recorded all over the world through his DAT "sound-reportages", utilized in a musical syntactical grammar. Go to the pdf link to discover some detailed informations. and http://it.wikipedia.org/wiki/Foto-musica (for a whole encyclopaedic description). • del 2011 Rataplànplanplan (first performance Berlin, BKA Theater, Unerhörte Musik). For the photo-sounds' archives – which Riccardo Piacentini, day after day and trip after trip, got together on DAT and catalogued on a specific database – go to the next pdf link. In this group of works (signed with the alphabetic letter E) you will find the PIACENTINI's compositions with electronic instruments or tape. 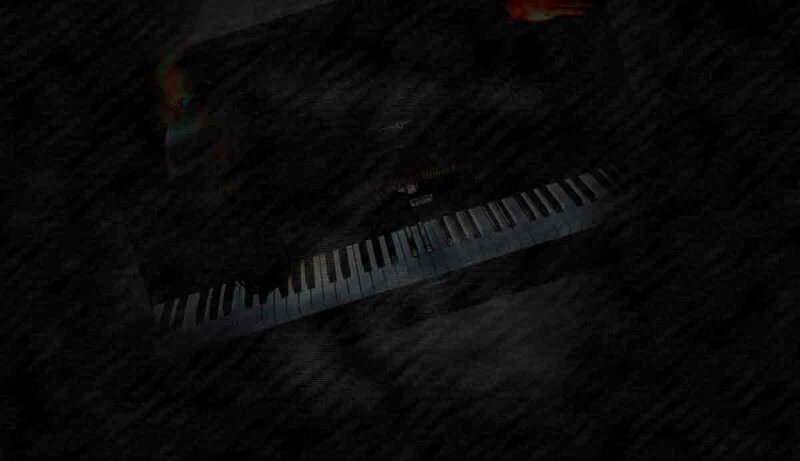 For the tape part, where it is not linked here, please contact the composer. Please go through the particulars in the file pdf linked to the following animated gif! In this group of works (letter B) you can find the PIACENTINI's compositions from ten players to the large orchestra with soloists and choirs. In this group of works (letter C) there are PIACENTINI's chamber music since three players to nine performers. 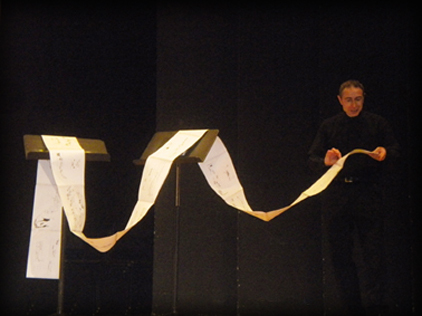 Here is the catalogue of PIACENTINI'S music for two players. PIACENTINI's music is very attempt to the single instruments. In these pieces PIACENTINI explores the depth of the technique and the expressive possibilities of the single instruments. He likes so much to work with the monochrome sound. Reviews but not only. Opinions too written from important persons of the world of the Culture. “Piacentini a du talent à revendre; son ouvre est féconde [...] d'heureuses trouvailles sonores et harmoniques. [...] une soirée essoufflante de beauté et de drame. [...] La musique, surtout d'origine informatique, était aussi passionnée que le sujet de l'opéra." (Nigel Barbour). “Di eccellente fattura è Strick II di Riccardo Piacentini, brano dalla scrittura contrappuntisticamente complessa, tesa e dinamica; la linea continua di semicrome iniziale trova requie solo in una seconda sezione più calma che rimane volutamente asimmetrica, impedendo così comodi confini ricettivi entro i quali collocarla." • La voce contemporanea in Italia, vol. 5 [The Italian Contemporary Voice, vol. 5] (Duo Alterno with Tiziana Scandaletti soprano and Riccardo Piacentini piano, Orchestra I Pomeriggi Musicali conducted by Roberto Gianola, Stradivarius 2011). 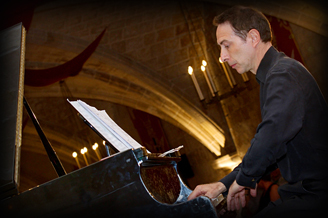 Other CDs with Riccardo Piacentini as pianist are at the WEB site of the Duo Alterno. • specific writings on “foto-musica con foto-suoni”© (go to www.rivegaucheconcerti.org).